The simplest ever method of the login to the app. Just enter your user credentials and press on the Login button, you will get logged in. Invalid credentials will lead to an error message. Welcome to VNCtask! This is the main screen which displays almost all functionalities. App switcher: The place where you can switch the app. Sidebar: Here you can expand or collapse the sidebar to see the full option names. List Title: Here you can see the list title and the number of tasks related to that specific list. 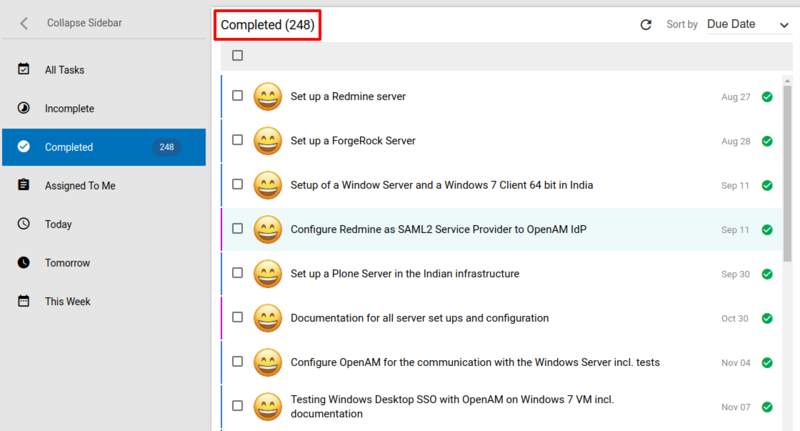 Task: This is the listed task, which displays: priority, checkbox to select, user avatar, task title, due date and current status. Reload: Here you can reload the task lists. Sorting: To see the list sorted by a specific attribute. Advanced Filter: The extended search with multiple filters helps you to find fewer but more specific results. User Profile: Displays the user profile with a user avatar and the option to log out. Settings: Here you can change the app settings. A powerful feature to get reminded of the tasks which are due to a specific date. Precisely, it will display the list of tasks which are overdue. Tasks: These are the names of the tasks which are overdue. 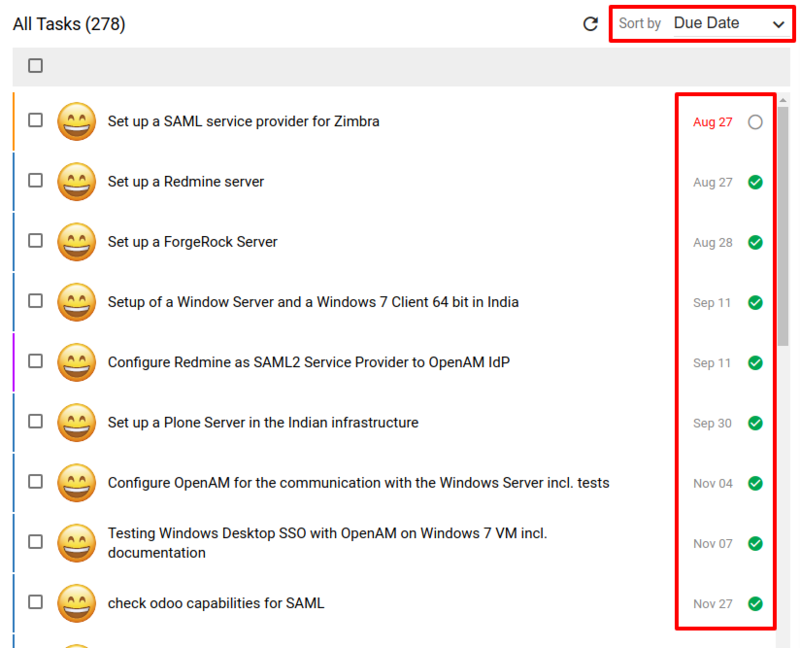 Overdue: Here you can find the specific dates of the tasks which are overdue. Close Button: By clicking on this button, you can close the popup dialog. By clicking on this button, a new window will pop up on the screenwhere you can add the details of your task. Text area: Please fill in the name of your task here; it is the only mandatory field to add a new task. Task properties: Here are the listed properties which you can add to the task. These can be also added later also while editing the task. Create Button: Clicking this button creates the task. As long as the task has no name, the button is deactivated. Close Button: Click here to cancel the task editor. Search/Typing area: Here you can search for start dates. The ~ sign identifies the start date. List of Dates: Here you can select the date directly. Dates are listed chronologically, starting with the current date. Pick Start Date: Select a date of your choice. A calendar will open and displays your selected date. You can't'set a date before the current date here. Back Button: By clicking on this button, you will be redirected to the New Task dialog. Search/Typing area: Here you can search for due dates. The ^ sign identifies the due date. Search/Typing area: Here you can search for projects. The = sign identifies the project. List of Projects: Select the projects which are assigned to you or a specific user. List of Users: Select the user here. List of Repeats: Select the repeat option: Every day, Every week, Every month, Every year, and No repeat. Task Title: You can enter the task name at any time. The task title is a mandatory field though. Selected Options: Already selected options will be displayed in gray. Unselected Options: Unselected options will remain blue. This is how the added task will be displayed in the list. By clicking on a listed task, that task will be displayed on the right side panel of the screen. 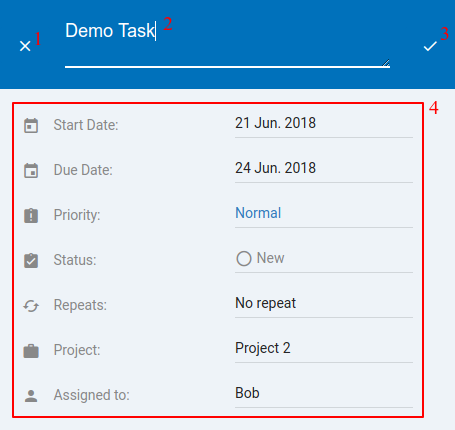 Task Details: Here you can find the properties like Start date, Due date, Priority, Status, Repeats, Project, and assigned user. To edit any task, you just have to click on the Edit button in the detail view and you can edit any task. Save Button: saves the changes. Due dates can't be before start date. 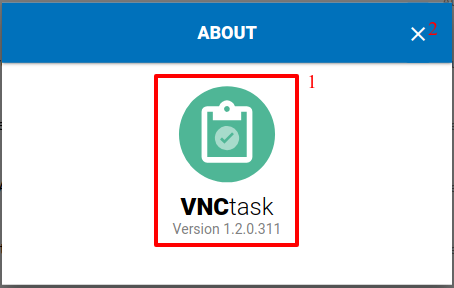 VNCtask offers Comments on tasks. With this feature, you can trace the whole task. The comments are available at the end of the task detail. To access it just tap on it. If you are clicking the send button without typing anything then you will face an error message. Comment are displayed in the details view just below the details of the tasks and above the comment typing area. The comment contains the user avatar, user name and date of the comment. 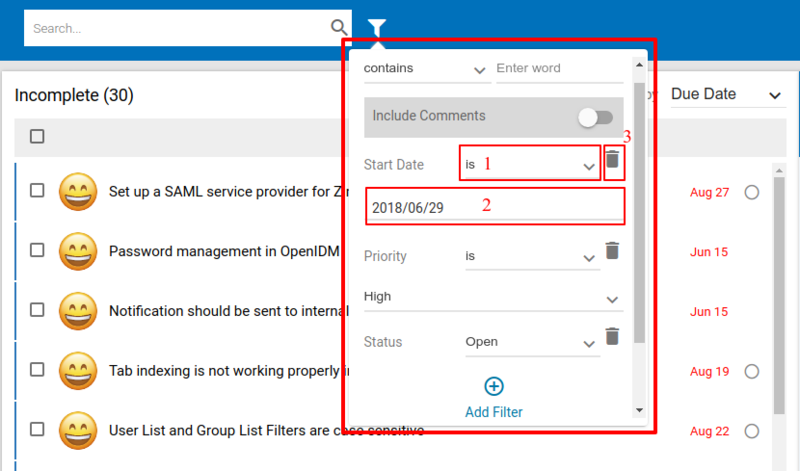 When you select any task list a statistics view is displayed on the right panel. 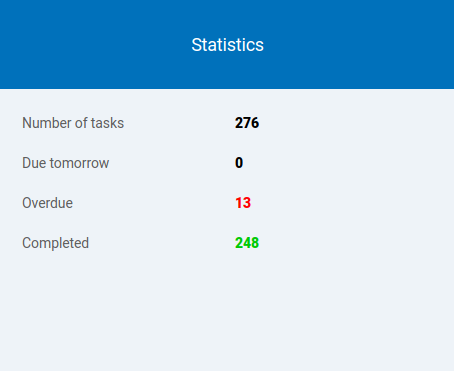 Statistics display the number of tasks according to different categories of the list which are currently displayed in the list view. Due tomorrow: Tasks which have the due date "tomorrow"
These lists will appear when you expand the sidebar (if it is not expanded) on the left side. It contains all lists based on its properties like dates, assignee, status and etc. "Incompleted" list is the default list after the login and you can see any list by clicking on the list name. This list displays all tasks. 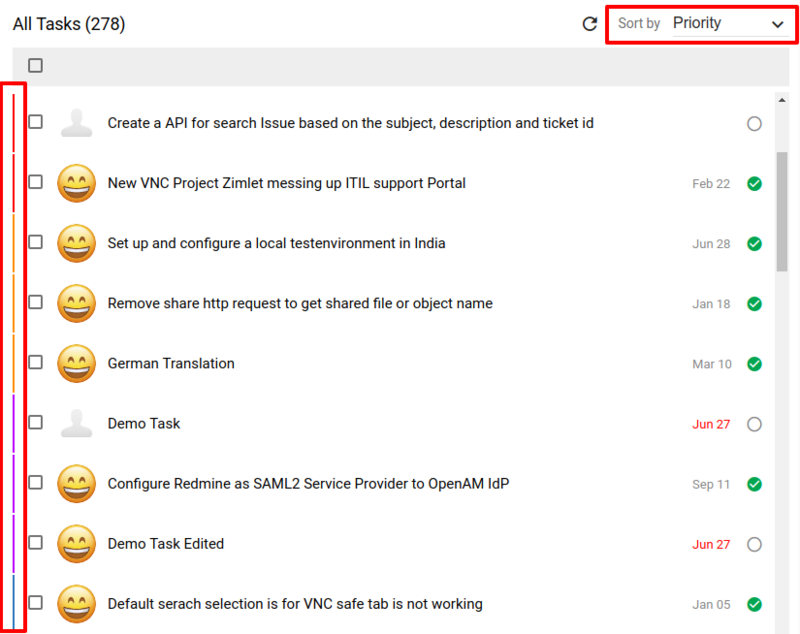 The list title also contains the number of tasks with the specific parameters. You will see this list after you logged in. This list displays only incomplete tasks. Incomplete tasks include the status New and In progress as well as the total amount of uncompleted taks. This list displays only completed tasks. The tasks which have the status Completed will be displayed in this list as well as the total amount of uncompleted taks. This list displays the tasks which are assigned to the user which is logged in. The tasks which are due at the current date are displayed in this list. The tasks which are due the next day are displayed in this list. The tasks which have a due date within the current week(Sunday to Saturday) those tasks are displayed in this list. You can update a number of tasks based on a specific Project, User, Start Date, Due Date or Priority. The easiest way to do this, is to click on the checkbox on the left side of the task name you want to update. A menu bar will appear at the top with some icons. You can mark multiple tasks which you want to update and do all update operations at the same time. Selected Tasks: Mark all tasks you like to update in their checkboxes. Check/uncheck all: By clicking here you can select all tasks in the list at the same time. You can also uncheck all the marked tasks and the bulk update menubar will disappear. Counter: This is the counter of the tasks. Complete: Click here to mark all selected tasks as completed. Clear/Cancel: click here to cancel the update, all tasks will be removed from the selection. Copy/Duplicate: click here to copy the selected taks. They will start as new tasks with the current date as start date. Delete: Click here and the selected tasks will be deleted. Context Menu (with multiple options): This menu will allow multiple options to change the properties of the selected tasks. 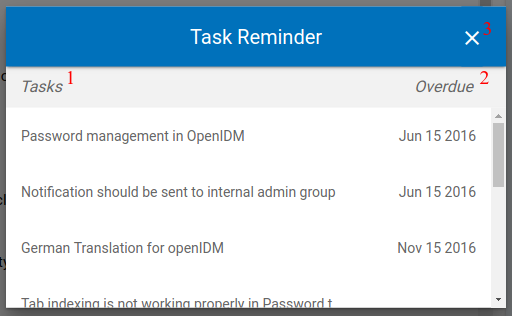 Multiple Tasks Display: In this view, all the selected tasks title will be listed with the counter as the header. If you de-select any task then that task will remove from this list. You can change the priority of all selected tasks here. A new dialog will pop up, where all priorities are listed. Just click on the required priority and it will update all selected tasks. If you want to change the repeat pattern of all selected tasks, select this button. A new dialog will allow the repeat mode. Select the needed one and it will change all tasks. Change start dates of the selected tasks from here. Change due dates of the selected tasks from here. Here you can change the assigned user for all selected tasks. 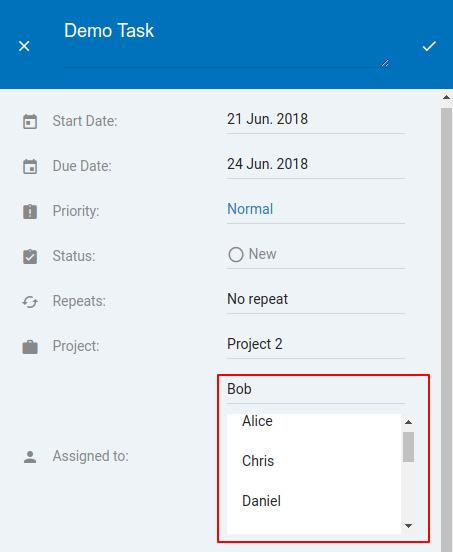 Change the assigned project for all tasks here. You can sort the tasks in lists by Due Date and Priority. This is the default sorting. To apply this sorting explicitly, you just have to click on the sorting drop-down menu at the top of the list view and select "Due Date". All tasks will be arranged in ascending order from very old due date to latest due date. To apply this sorting, select the "Priority" option in the sorting drop-down menu at the list view. This sorting is based on priority so all the tasks will be arranged in priority order i.e. from Immediate to Low. The search bar is located in the upper center of the window. Type your search term into the search bar and press enter or click on the search button on the right side. You will get the search results below the search bar. If there are no any matches for the search content then it will show a message that You have no tasks at the moment!. Otherwise you will find the search results sorted by due date. You can also switch to priority. Search Term: Type in your search term here. Counter: Here you can see how many search results were found. The search results are limited to 25 results first, if you scroll down, more results are loaded. Cancel Button: Return from search to the main window here. Result Area: Here you get your search results displayed. Search Statistics: This is displaying the statistics of the search result: how many tasks are there, how many overdue, completed etc. Filter Option:Here you can open the advanced filter. Include Comments This is a slider/switch button so you can decide if you want to include comments in the search or not. Add Filters Button: To add more filter options you can click here and you will get a list of filter options. Clear Button: It will clear all the entered data in all the fields when you click here. Apply Button: After entering all data, click here to apply the filter. There are many filter options available and you can easily filter your search based on all that filters. Select a filter: each filter has its sub filter options to set a value. The list of sub-options. You can select any option from that list by just clicking on it. This is the value field based on the selected sub-option where you can set the required value. From here you can remove/delete the filter. Due Date: This is working like the start date and it has the same 22 sub-options which will give you a precise . You can set preferences within the VNCtask application. These are account settings, related to languages, servers, Help and Manual etc. To show these settings, click on the cogwheel icon on the right side of the header. Language Selection: Here you can change the language. VNCtalk offers English and German at the moment. Update Button: By pressing this button the selected language will be saved. Close Button: To close this dialog click on the close button. Here you can find helpful links for VNCtask (1). To close the popup, please click on the X at the top right corner. 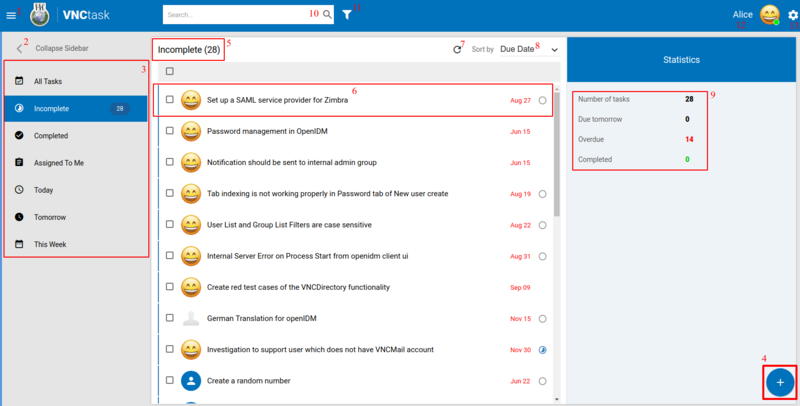 Here you can find the link to the VNC Service Desk (1). To close the popup, please click on the X at the top right corner. Changelog Button: From here you can access the changelog details with all the versions and updates. Close Button: To close this dialog you can click on the close button. App Details: These are the app details like full name, and current version. Click on your user profile to toggle the logout-button.